Loanee Daniel Nti’s path to FC Halifax Town has hardly been conventional - there can’t be too many footballers who have a degree in psychology. Nti joined on a month’s loan from York last week and marked his Halifax debut with a goal in the 4-2 win over Saford last Saturday. The winger earned a 2:1 in the subject at Loughborough University while trying to forge a career in football, having started in his local Sunday League. “I’ve built myself up through playing Sunday League - York was the first professional club I’ve signed for,” he said. “I played Sunday League, then went to university and played at Loughborough, played in the England Universities team. “I enjoyed my time at university but fortunately I get to call football my job now. “I was interested in the subject and I wanted to do something that isn’t related to football, just in case I want to go into something else after football. “Psychology offered me a broader outlook and hopefully after football I can get into that. “It was hard work combining the two but if you want something enough you can make it work. 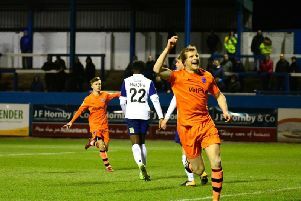 Nti has started just six league games for York, and admits the move there hasn’t worked so far. “My sole ambition was to get a first professional contract when I was at university,” he said. “In the last season I was with Loughborough I scored 49 goals. “It was a great time for me at Worcester - I had a great manager there in Carl Heeley. “Off the back of that I got the move to York. It was a great feeling to get that move. “It hasn’t gone to plan but I’m just looking to fight my way back there. Nti said his debut could not have gone any better after his goal early in the second-half sparked Halifax’s stunning comeback against play-off rivals Salford. He added: “It was great to get a goal - some of the lads were saying there have been a few debut goals so they didn’t put any pressure on me or anything! “I enjoyed the game and the fans were amazing. “We conceded two in the first-half but I knew we could turn it round, we had that belief in the dressing room. “All we needed was that first goal, luckily I got it, and that pushed us on. “The gaffer was telling me to stick to my position and to be fair, it worked.